Alida Draudt and Julia Rose West are not only co-authors, business partners, and best of friends, but most importantly, they have differing points of view—which is ideal for two budding Silicon Valley futurists. Alida currently works as a futurist and design strategist at Capital One, and Julia is a design strategist and user experience manager at Ancestry.com. In their recently published book, What the Foresight, they describe the mindset, practices and tools leaders need to explore multiple futures, identify their preferred future, and then take steps to create it. In their view, the future’s complexity requires looking at it from multiple viewpoints and angles. Their favorite time period to explore is 10 to 15 years out—close enough to the present to draw connections, but far enough out to innovate and challenge assumptions about what is understood to be true today. The most challenging and maybe most important aspect of foresight is connecting future scenarios—both those we aim for and those we’d rather avoid—to actionable steps which can be taken today. I recently connected with Alida and Julia. Read on to find out how to think more like a futurist, the connection between foresight and design, and why MadLibs is the secret to seeing the future more clearly and building the world we want. 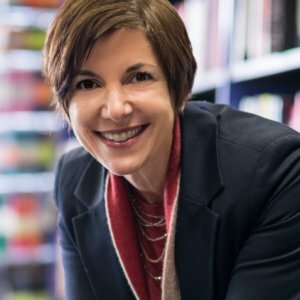 Lisa Kay Solomon: What specific skills help you think like a futurist? Alida Draudt: Important skills to hone for futurists are systems thinking, challenging assumptions, and examining levels of zoom. Futurists cannot think solely about one aspect of a system—we have to think about all the potential causes and effects. Challenging assumptions means breaking from how most people see “the future”—the expected trajectory—to create interesting and stimulating future scenarios. We question present assumptions to see what other possibilities might be out there. Finally, levels of zoom requires thinking both about the big picture—societal changes, megatrends, movements—as much as about the tactical level. Being able to switch between these two modes of thinking means looking into how the world in 10 years may be generally shaped and then translating that into specific tangible stories to help make it make sense in the present. Julia Rose West: A futurist needs empathy. This is the ability to understand what motivates humans biologically and sociologically—to identify the pressures, desires, and emotions that affect people and societies. These deeper forces of the human condition are like continental plates. They underlie all possible futures. Futurists also need to be good researchers and to work well with others. I can’t emphasize the importance and necessity for collaboration enough. LKS: You both work as futurists and design strategists in your respective companies, Capital One and Ancestry.com. How does the discipline of foresight differ from the discipline of design? How are they similar? AD: In both foresight and design, you start by understanding the present landscape, articulating assumptions and values. Once a baseline is created, you go wide, exploring many possible ideas. Then one idea is identified from your exploration, broken down to its components, and prototyped. Foresight and design differ, however, in two key ways. The first is time period. Design tends to look at around a two-year (plus or minus a year) manufacturing and launch cycle. Foresight is about going out further, looking at uncertainties beyond the typical business cycle and then translating that into the present. The second difference is in direction of process. Design tends to look from the present forward, articulating consumer needs as they are observed today, and then creating products, offerings, or services which anticipate those needs. Foresight is the opposite. 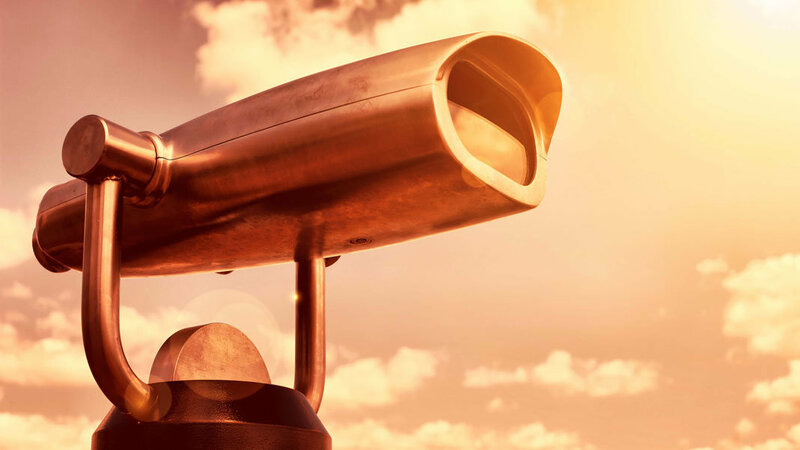 While still leveraging current trends as an information base, foresight also jumps into the future to articulate how an entire world, industry, or swath of society may behave. Then it works backward to the present to articulate key milestones on the way to that future. In other words, design is inside-out, foresight is outside-in thinking. By blending the two modes, we can integrate foresight and design to create more strategic offerings in the present. JRW: Both design and foresight aim to solve a problem. Also, great design aims to solve the needs of not only the present but of the future… in some ways it can define the future and the future needs and desires of users. The biggest difference between design and foresight is the impact of design is almost immediate. With foresight, we are asking our participants to wait for the outcome. It is not the immediate gratification we are familiar with in design. LKS: Can you share a concrete example of a foresight project you’ve done and how it’s help shape a strategic decision? JRW: I recently researched a “Future of Family History” talk I gave in Salt Lake City last month. Initially, I had some assumptions about the topic. After I went through the foresight process of research, consulting our executives, and tapping external experts—I realized the four possible futures discovered were far more interesting and exciting than I could have ever envisioned without this rigor. By having these conversations about the future, changing people’s assumptions, and socializing possible futures, I believe we have effectively changed the future. The next steps are always the most challenging… evaluating the possibilities, selecting a direction, and creating applied steps to get there. LKS: In your new book, What the Foresight, you present a very accessible overview to the practice and tools of foresight. Can you share one of your favorite techniques in the book and why you think it’s so effective? AD: We use and love all the tools and techniques included in What the Foresight. It’s difficult to choose just one, but one I love is the Alternative Futures MadLibs. The Alternative Futures method uniquely provides archetypes for four different futures to explore—growth, collapse, discipline, and transformation. 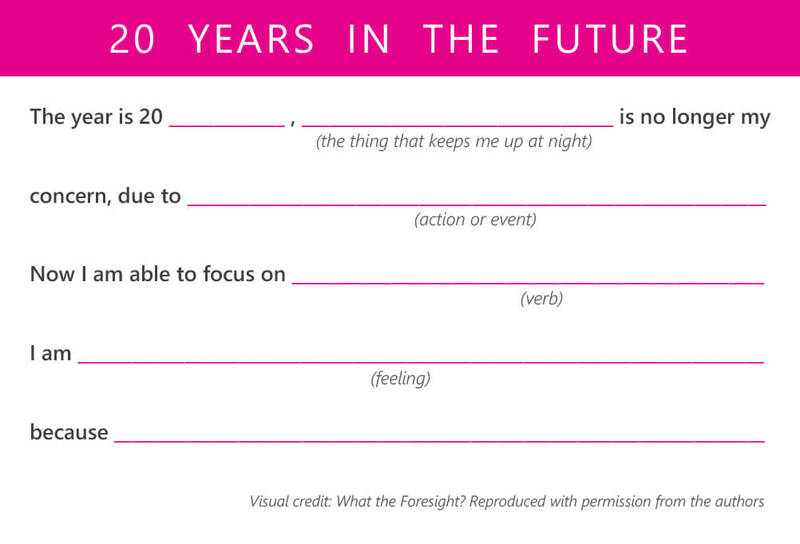 We distilled each archetype into a MadLib format to help people explore a world 20 years in the future. The futures are sometimes daunting places to think about, but by using a familiar format like MadLibs, users can imagine wildly different worlds fairly easily. As a technique of exploration, this is one of our favorites. LKS: What is your hope for the future of foresight? AD: We are both working to integrate foresight into our companies, in mindset and practice. This is more necessary now than ever given the rapidity of change in all industries. We hope the foresight mindset is integrated into all levels of our community, from CEOs to elementary school teachers and students. It will take methodical and intentional action to integrate, but if we can all get better at foresight—particularly from a young age—we will be better able to consider a wide variety of possible futures and design toward optimal futures. JRW: Foresight takes time and dedication and is a hard sell. Most people have a difficult time seeing the benefits of and exploring the long view. In America, and especially in business, we love the growth scenario and as long as business is booming, we can hardly imagine a future otherwise. But this is the most important time to begin exploring other possible futures and innovating. Strategic foresight is not just about waiting 10 years to see the outcome; there are present steps that can be taken for immediate application. I hope we begin to build regular foresight exploration into our business cycles. Similar to product cycles, once a product is launched we don’t wash our hands of it and say we’re finished, we continue to do releases and updates. The same should be true for foresight—the updating of possible futures, roadmaps, and screening for unattractive ones on a regular cadence.